This article is part of an educational supplement to Applied Radiology, supported through an unrestricted educational grant from Guerbet, LLC, and represents a summary of one of the presentations in a 4-part webcast series titled Contrast Enhancement in MR Imaging: New Options, New Techniques, New Opportunities. To obtain educational credits, visit www.appliedradiology.org/CONTRAST, where you can review the video presentation for this and the other parts in this series and where you will find a link to the appropriate post test based on your profession. Transmetallation (also referred to as dechelation or dissociation) has been used to explain the association between gadolinium contrast agent administration and the development of nephrogenic systemic fibrosis (NSF) in patients with severe renal disease. The theory holds that the gadolinium-ligand bond for each agent has a specific bonding strength, or dissociation constant, that defines the “tightness” of the bond. Although all bonds can and do eventually dissociate, bonds with a lower dissociation constant (in other words, less stable) would be more likely to dissociate in a given amount of time than would one with a higher or stronger dissociation constant. Similarly, the lower the bond stability, the less time it takes for the gadolinium ion and ligand to release from each other’s “grasp.” Once free the ion can associate or bond with other moieties that might be found in their molecular neighborhood. Chelate structure and nature of bonding with gadolinium both impact agent stability. Ionic bonds have higher stability than do non-ionic bonds, and macrocyclic (ring structure) chelates are far more stable than those that are linear. Non-ionic linear agents have the lowest expected kinetic stability, followed by ionic linear, non-ionic macrocyclic and ionic-macrocyclic bonds. Of the 9 GBCAs commonly utilized clinically for diagnostic MRI, Omniscan and Optimark are non-ionic and linear, while Ablavar, Eovist, Magnevist and Multihance are ionic and linear. Gadavist and Prohance are non-ionic macrocyclic, and Dotarem is ionic and macrocyclic (Table 1). The extracellular fluid space GBCAs used in neuroimaging have biologic half-lives of roughly 2 hours or less, and are predominantly or only excreted from the body by the kidneys. Transmetallation theory predicts that under normal circumstances by the time any significant dissociation of gadolinium can develop, the vast majority of the administered dose will have already been cleared from the patient. With poor renal function and prolonged in vivo dwell times of these agents clinically significant quantities of dissociation might develop. This would be expected to be more pronounced with the least stable agents, on the one hand, and least so (in the same time frame) at the other extreme of the dissociation spectrum. Theory suggests that the free gadolinium ion subsequent interacts with patient tissues and somehow triggers fibroblast stimulation and development of clinical NSF. Thus, from the perspective of transmetallation theory alone, it seems that non-ionic linear GBCAs would have the highest predicted rates of NSF development, with ever-decreasing rates of NSF development predicted to follow administration of ionic linear agents, then non-ionic macrocyclic agents, then ionic macrocyclic agents. Indeed, much evidence does seem to support the theory of transmetallation. Hundreds of cases of NSF have been associated with the prior unconfounded administration of Omniscan, one of the non-ionic linear agents. Although the total worldwide distribution of Optimark, another non-ionic linear agent, is far lower than for Omniscan, dozens of cases of NSF have also been associated with the prior unconfounded administration of Optimark. Further, there have been no reported cases to date of NSF associated with the prior unconfounded administration of Dotarem, the sole ionic macrocyclic agent. Nevertheless, several significant and reproducible observations exist that cannot be explained by the theory of transmetallation alone, yet they have not been stressed in the peer-reviewed literature to date (Table 2). For example, roughly 100 cases of NSF have been reported to have developed after the prior unconfounded administration of Magnevist, a linear ionic contrast agent. 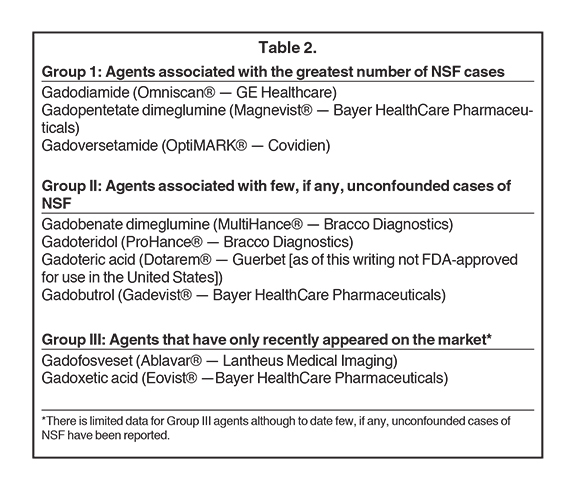 Yet the total number of cases of NSF that have been reported to have developed after the prior unconfounded administration of either Ablavar, Eovist or MultiHance is zero — yet each of these is a linear ionic contrast agent as well. This is inconsistent with transmetallation theory alone. Furthermore, three cases of NSF have been reported following the prior unconfounded administration of Gadavist, while another possible case has been reported following the unconfounded administration of ProHance. While these are extremely small numbers, based on transmetallation theory, one might well have theorized that no cases of NSF should have developed following the prior unconfounded administration of either of these macrocyclic agents. Transmetallation theory may be insufficient to entirely explain all that we have observed with the clinical development of NSF to date. It is most interesting to note that Ablavar, Eovist and MultiHance are all the only GBCAs in use today that interact and/or bind with serum proteins. Perhaps this association — creating relatively massive molecules — might in some other way interfere with the dissociation of the gadolinium ion from its ligand molecule. The European Medicine Agency’s (EMA) Committee for Medicinal Products in Human Use (CHMP) and the European Society for Urological Radiology (ESUR) have designated risk categories based on transmetallation theory (Table 3). These agencies classify the macrocylic agents as low risk for NSF, the linear ionic agents as medium risk, and the linear non-ionic agents Omniscan and Optimark, plus the linear ionic agent, Magnevist, as high risk. The American College of Radiology Manual on Contrast Media v9, published in 2013, on the other hand, divides MRI contrast agents into three categories based on perceived NSF-related risks based on transmetallation theory, but also on the number of cases of NSF associated with these agents to date. The FDA has taken a different approach, and has listed Magnevist, Omniscan, and Optimark as contraindicated for patients with severe or worse chronic kidney disease or acute kidney injury. Nephrogenic systemic fibrosis update 2014: Fact versus theory. Appl Radiol. Dr. Kanal is Professor of Radiology and Neuroradiology, and Director of Magnetic Resonance Services, at the University of Pittsburgh Medical Center, Pittsburgh, PA.